Action-packed adventures at sea are what Ibiza Watersports is all about. You’ll see hidden beaches, caves and coves and you get to try out their cool water toys in a super fun island boat trip. 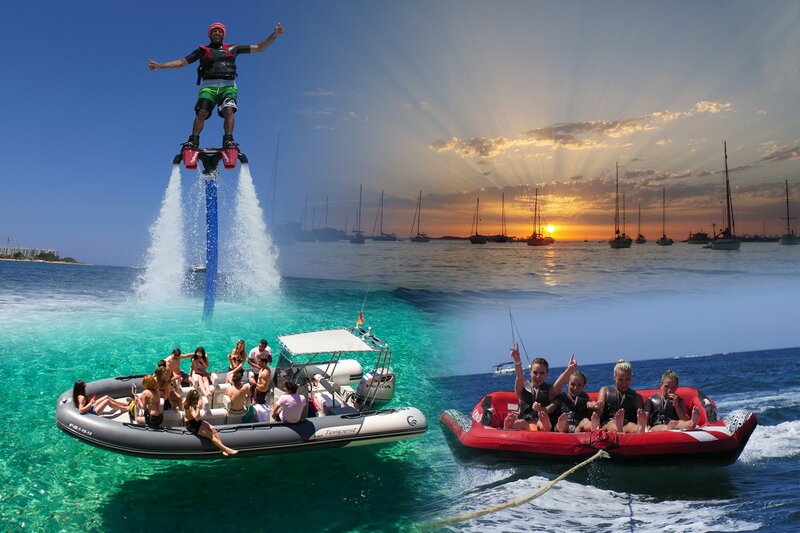 Discover your wild side with Ibiza Watersports' adventure-filled trips and try out a flyboard, a Bladefish sea jet, snorkelling or mess about on an inflatable watercraft. You can play on the water or pause to take in the incredible coastline replete with hidden caves, beautiful beaches and secret coves. Adrenaline junkies can try out one trip and then do another the next day or even all three. Have a look through the options below, to see which suits you. Try out one of our exciting wakeboard or waterski trips and learn from the very best on one of these fantastic adrenaline-fueled rides. Jetting out to sea at high speed being pulled on a waterski or wakeboard is one of the most popular activities at Ibiza Watersports and you'll find one of the widest varieties of boards, skis and equipment on offer in the island. Add the spectacularly beautiful and wide San Antonio Bay as your playground and you have the perfect trip for cool exploits at sea. If you are an absolute beginner, you can book a lesson of the wakeboard or waterski with advice and tips from their experienced instructors. If you have good experience, you can simply book one of the 20-minute rides. Fly like Iron Man, swim like a dolphin on a flyboard, the new sport that is revolutionising watersports. Each ride is 20 minutes long and is ideal for have-a-go individuals or those looking for an exciting group activity. You will be strapped to the board, connected by water hose to the jet boat that's waiting to take you on a spirited sea adventure. The hose creates powerful jets of water that lift you high into the sky from the clear waters below, taking in the amazing views of San Antonio Bay around you as you rise up. You'll get a full safety briefing on how to use the board from experienced instructors before jetting out: no experience is necessary as the basics are easy to master. First timers are all welcome. Flyboard, speedboat, beach and snorkeling trip and bladefish. An ideal pack for those that like a thrill sensation. The flyboard is fast becoming the most coveted new water sport, so you can get an edge on your friends back home. You'll soar high into the air using powerful water jets and fly like a superhero. The trip gives you 1.30-hour boat excursion that takes in the beaches of Cala Conta and Cala Bassa and on the way you'll see cliffs, caves and coves and pass by small islets. This pack is fun filled, giving you a 40-minute stop to swim and snorkel or try the Bladefish sea jet so you can see the marine life above and below. There's some great music and free drinks on board for you to enjoy too. Price includes: snorkel gear, free drinks and good music on board, life jacket, insurance. Sunset trips moreover includes a glass of champagne. Flyboard, speedboat sunset trip and inflatables. With this pack you get to try the latest craze in watersports, the flyboard that takes you high into the air like Superman. This is followed by a 1.45-hour sunset boat trip that takes you via Cala Gracio, Cala Gracioneta, Cala Salada and Cala Saladeta. You also get a full 40-minute stop in front of the famous bars of the Sunset Strip in San Antonio, where you can watch the sun go down in style with a bit of bubbly. This trip also includes 2 inflatables of your choice to get you out on the water and free drinks and on board music. It's an incredible voyage and one you'll be itching to do again and again. Activity time: Day trips every day at 15.00 and 17:00. Sunset trips every day at 19.00. Other times available on request.